So a friend of mine who has TV show covering movies and premieres recently came back from Hollywood after attending the press junket for Hollywoodland. He relays to me that actors Adrian Brody, Diane Lane, Bob Hoskins, and Robin Tunney all managed to attend, but Ben Affleck was conspicuous by his absence. Ben, if your reading this (as if), you’re telling me you can make it to a ‘Reindeer Games’ presser, but miss out on what is probably your best film since ‘Good Will Hunting’? Come on man! 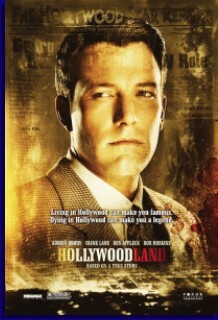 Hollywoodland branches off basically as two movies, one I liked an awful lot and another one I didn’t much care for. On a warm day in July in 1959, George Reeves (Affleck) the original TV Superman puts a bullet in his head. Or at least that’s the official story, as the rabbit hole apparently goes much deeper. Now meet Louis Simo (Brody), a scuzzy, glory hound, ambulance chasing private investigator who takes on the case at the behest of Reeves odd mother who is convinced her son didn’t kill himself. This is where the movie splits in two as we follow the rise of George Reeves from a old school Hollywood bit player, his encounter and lengthy affair with the wife of the head MGM Toni Mannix (Lane), his landing of the role of Superman, the curse of that role, and his eventual undoing. We also follow the life Simo, as a an unscrupulous Private Investigator, lousy husband, lousy father, and lousy boyfriend who is chasing the ‘truth’ for no other reason than to get his name in the paper. It seems however, the closer he gets the more dangerous it gets as he has obviously stumbled upon something. He just doesn’t know what. People tend to hate quite a bit on Mr. Affleck, and Lord knows he has turned in some serious stinkers in his recent history (can you say Gigli). But the man does bring a certain charm to his roles and he manages to execute that charm, and be funny, as the put upon George Reeves who has Clark Gable’s chin, but not his talent, but desperately wants his career. Following George Reeves life was captivating and highly entertaining to me and quite honestly, the movie could have just centered on that alone. From the Hollywood parties, to the ‘From Here to Eternity’ screen tests and the audience reaction to seeing ‘Superman’ trying to be in a regular role, was something almost any fan of movies would enjoy. Adrian Brody’s Louis Simo, on the other hand, could have been clipped from the movie the same way Reeves was clipped out of ‘From here to Eternity’. The character was unlikable, and thankless, and quite honestly, I didn’t care he if connected with his son or his ex-wife. Switching the movie to his problems took the film away from what it should have been about, which was the life and death of George Reeves. I know Mr. Brody has an Oscar on his mantle and all, but the movie could have shred about a half an hour from its running time and been way more interesting if his investigator was merely a guide as opposed to a story all in its own. But hey, that’s just my opinion. Not that it wipes the stench away from ‘Surviving Christmas’ (now there’s a party game: Every body take a drink when mentioning a bad Ben Affleck flick) but I recommend Hollywoodland as very interesting look into one Hollywood’s greatest mysteries. And another mystery is how they managed to make Diane Lane look old.